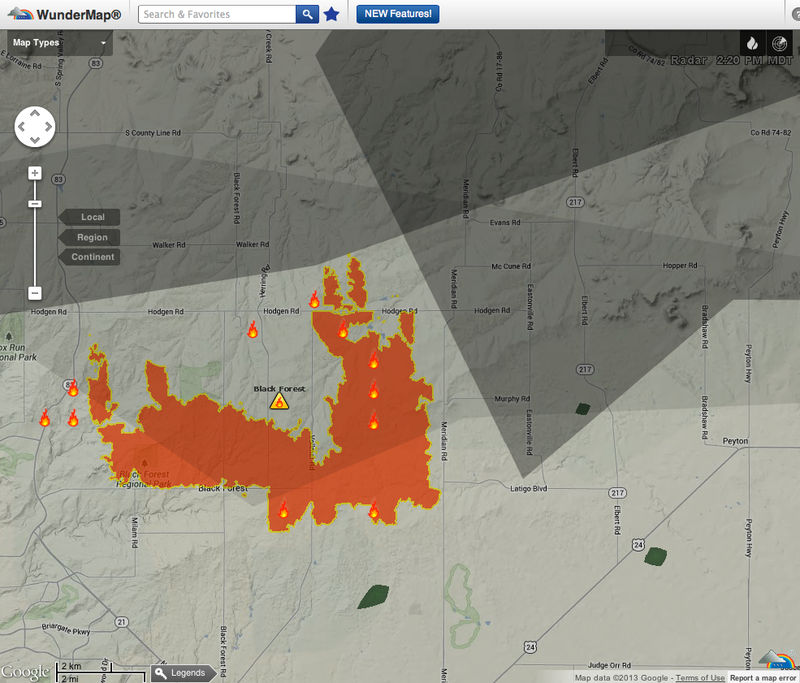 I discovered that I can see the location and extent of a wild fire in the US in real time at Wundermap. In the upper right click on "Layers" then click "Active Fires." Then there will be a flame icon in the upper right of the map. Click it and you will see a drop-down menu of current fires. The huge fire today near Colorado Springs is called "Black Forest." The graphic: Screen capture of Wundermap showing the "Black Forest" fire just NE of Colorado Springs the morning of June 13. It cuts off Layers and the selection of "Fires," but it shows the flame control icon at upper right. The small flame icons in and around the orange overlay are fire spots detected by satellite! Click to enlarge.